A few weeks ago I stumbled across this hashtag on Instagram (#ohszippedcase) and it led me to a fun (and free!) 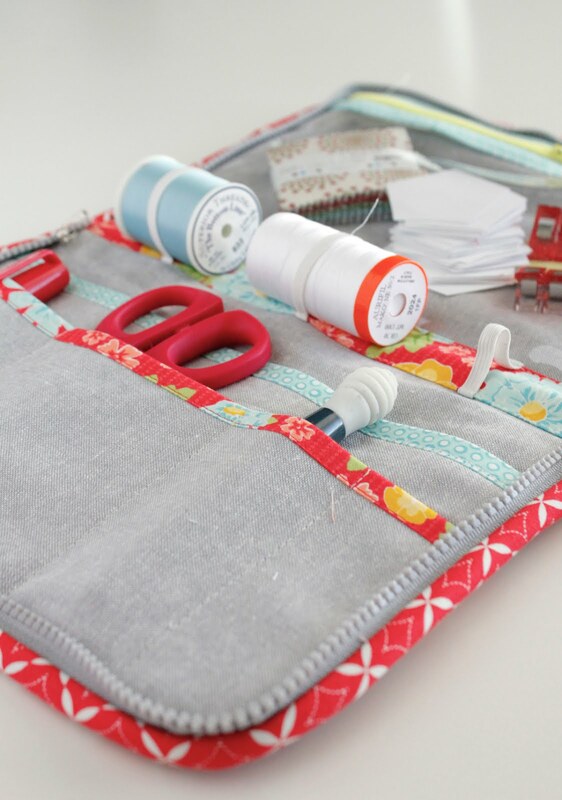 PDF tutorial for this great zipped case. The case is designed by Melissa LeRay who blogs over at Oh How Sweet. 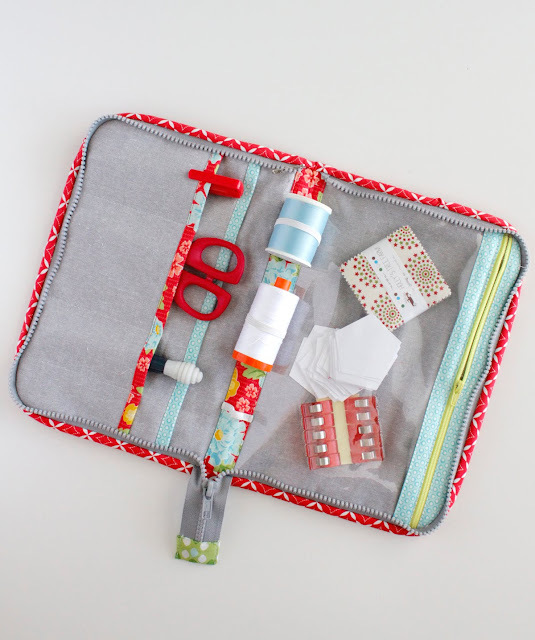 It's perfect for my EPP projects - but it'd be handy for all sorts of things (like a secret chocolate stash!) I love the vinyl pocket on the right, and the elastic down the center for holding thread. Confession time: when I first read through the tutorial I was completely intimidated by it, and I actually procrastinated working on it because I was so SURE I'd mess it up. But I did just fine! This is a well-written tutorial and I found it easy to follow. Even for an inexperienced bag maker like me! I had some scraps of Summerfest fabric hanging around and I wanted to use every. last. bit. of those pretty scraps. This case was a great way to do it. Before starting, I took some time to customize the outside of my case. 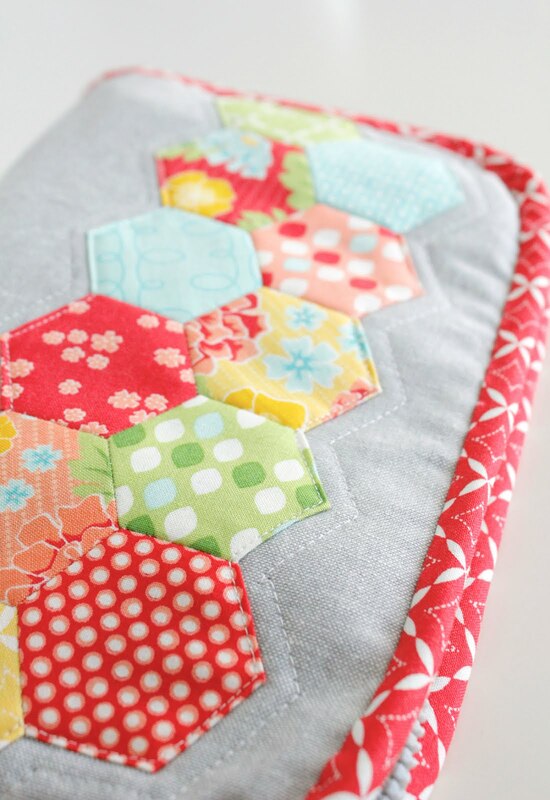 I made these hexies and then glued them in place with some applique glue. I then top stitched around them and did one line of echo quilting on the sides. Then I followed the rest of the tutorial as written. Now that I've made one, I feel much more comfortable customizing my next one even more! And next time I won't use a "sport" zipper - I'm finding this one difficult to close around the curves. You can find Melissa's blog here, and the printable PDF tutorial here. 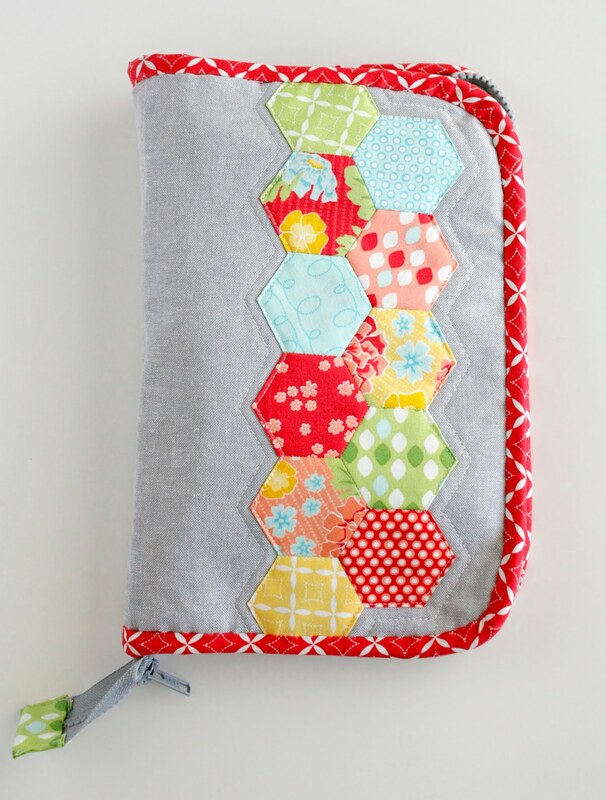 And if you make an Oh How Sweet Zipped Case, be sure to tag it on instagram (#ohszippedcase) so we can all see it too! I love your Zipped Case! Thank you for the pattern. The only part that really scares me is the zipper around the curves. What kind of zipper would you use instead of a sport zipper? Thanks.